Readers who have followed this blog for a while now know that I am a Momofuku fan girl. I won't claim that everything that Chef David Chang touches is z-OMG the best evaaa (ahem Noodle Bar you're kinda whack), but the Momofuku group definitely puts out more hits than misses for me. The Bo Ssam from Momofuku Ssäm Bar is clearly a crowd favorite. 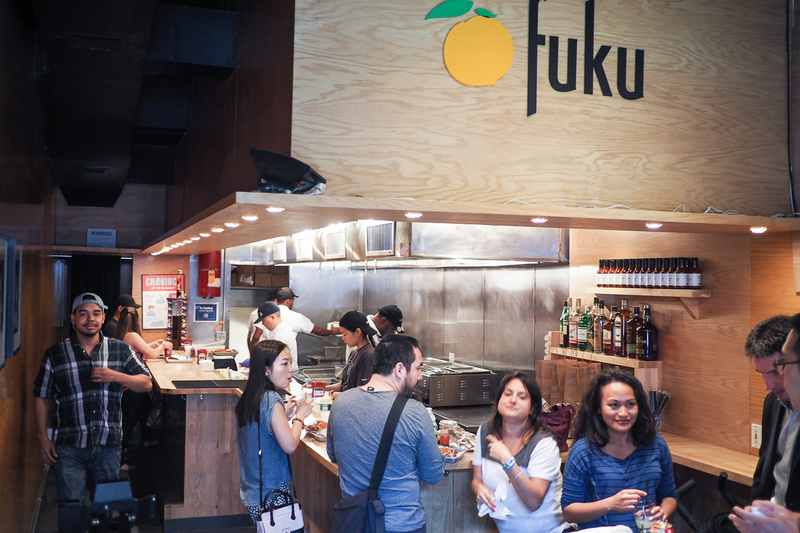 While David Chang has been huge in the culinary world for almost a decade now, the Momofuku brand has only had a presence in NYC, Toronto or Sydney. 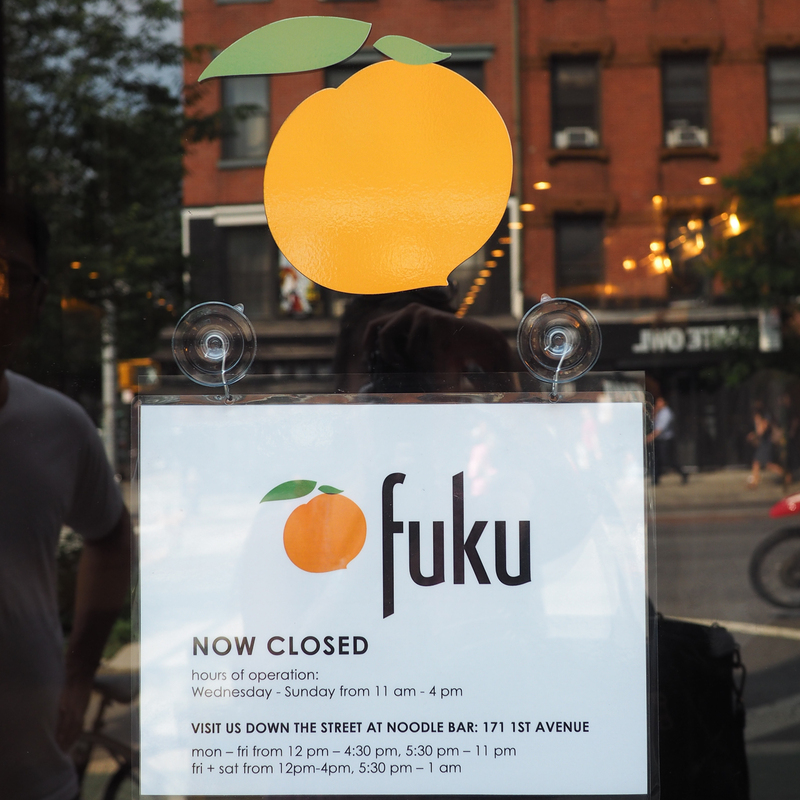 Unless you're in these 3 cities, you're not getting any Momofuku love. Chef Chang has mentioned that he dreams of bringing great food into the suburbs of the United States one day. And....this dream begins with Fuku. 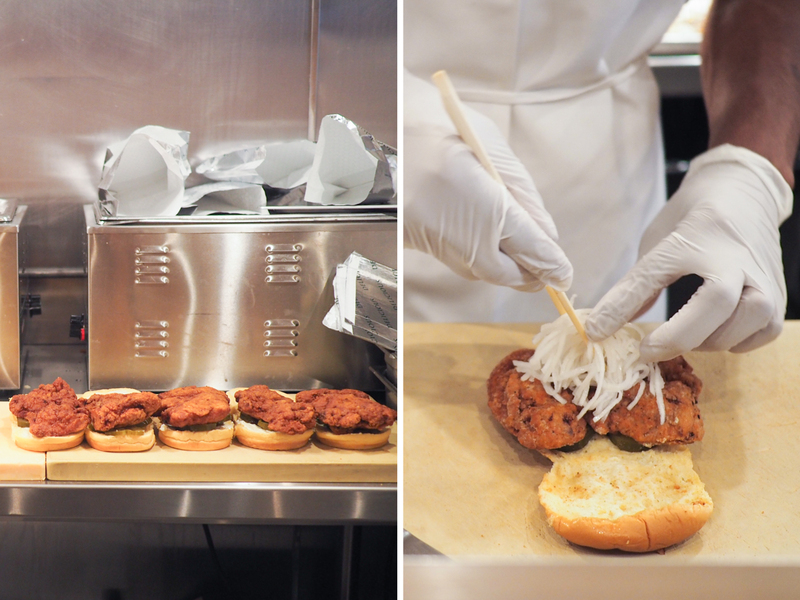 Fuku is the newest Momofuku concept which only serves fried chicken sandwiches in a fast-food type of environment. Because let's face it, who doesn't love fried chicken?! The menu is simple. Literally, you can only order a spicy chicken sandwich, fries, a fuku salad and drinks. The Lunch Combo includes the sandwich, fries and a non-alcoholic drink - but I say skip the combo cause the steak fries are "meh" compared to what you get in your sandwich. 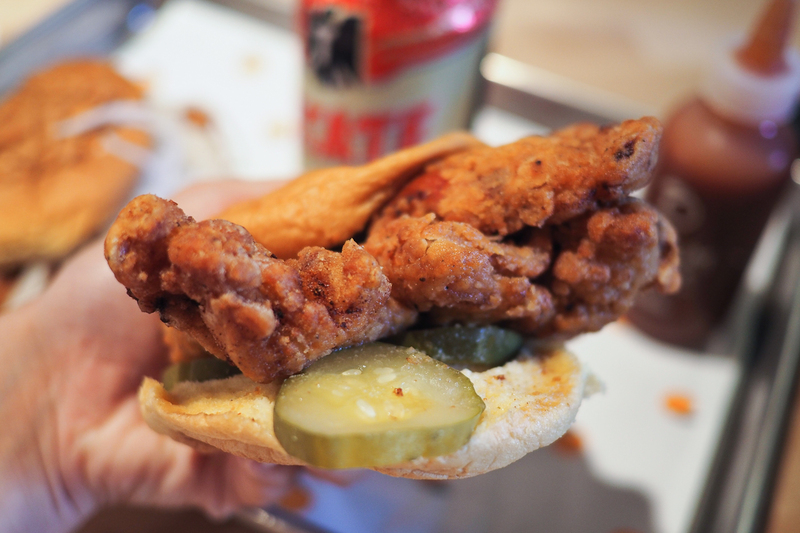 I'm telling you, this Fried Chicken Sandwich is HUGE. 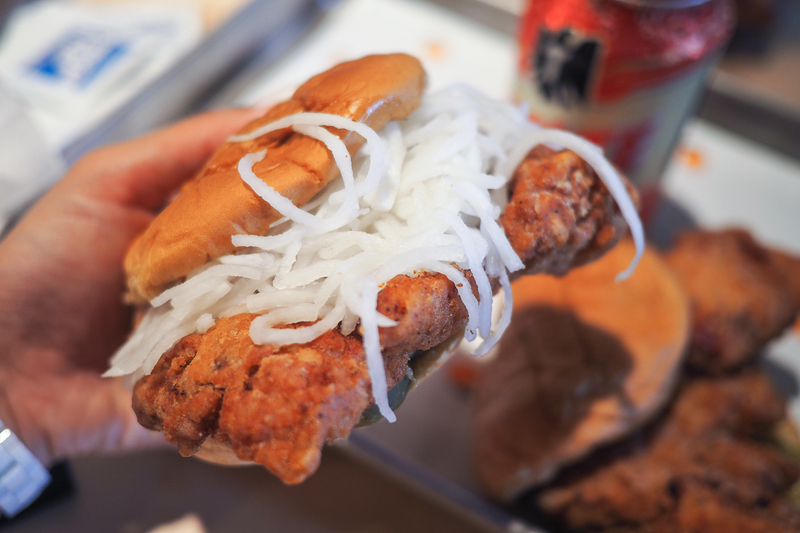 Basically you're using the lightly mayo'ed potato roll bun as a way to hold the spicy fried chicken thigh with your hands, without your hands getting greasy. No joke - the chicken is almost 2x the size of the whole bun!! 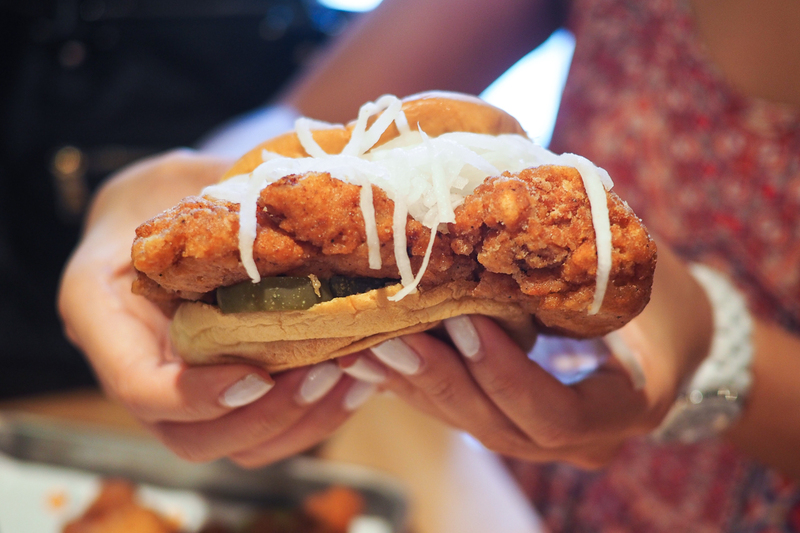 This results in a few bites of straight up chicken, sans bun. Not complaining here. The batter on the chicken is just right, not too thick nor too thin. 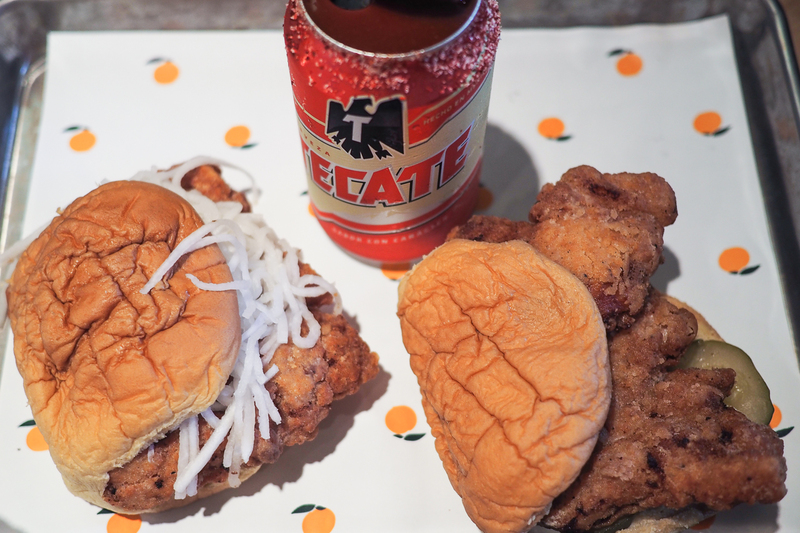 The chicken is said to be marinated in habanero puree and buttermilk, covered in a spice blend, and then deep fried. 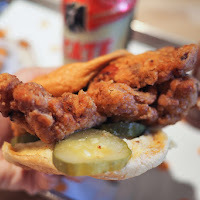 The habanero spice in the mix gives it just a tad of spice - nowhere near as spicy as the habanero fried chicken I've had at Momofuku Má Pêche. Much to my disappointment, but my non-spicy friends' relief I bet. The pickle helps give this a bit more contrasting flavors as it helps cut the fat a bit. But seriously, considering how well fried this chicken is, you don't even have to really worry about it being overly greasy. I'm telling you it's fried chicken perfection. Since I'm a nerd who reads a ton of food blogs, I found out about the secret menu item: The Koreano (Thanks Eater!). You can ask for this picked daikon slaw to be added to your sandwich - and I'm telling ya - you definitely have to ask for it because it's clutch. 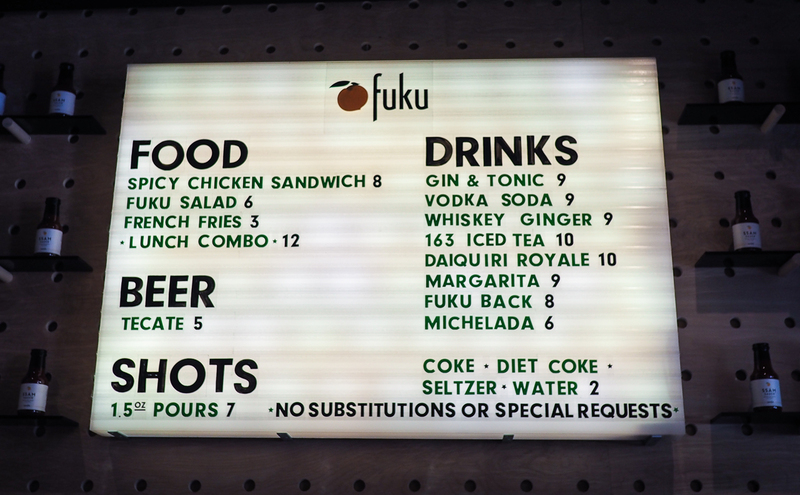 So besides the sandwich, another thing they're having fun with here at Fuku is their drinks menu. 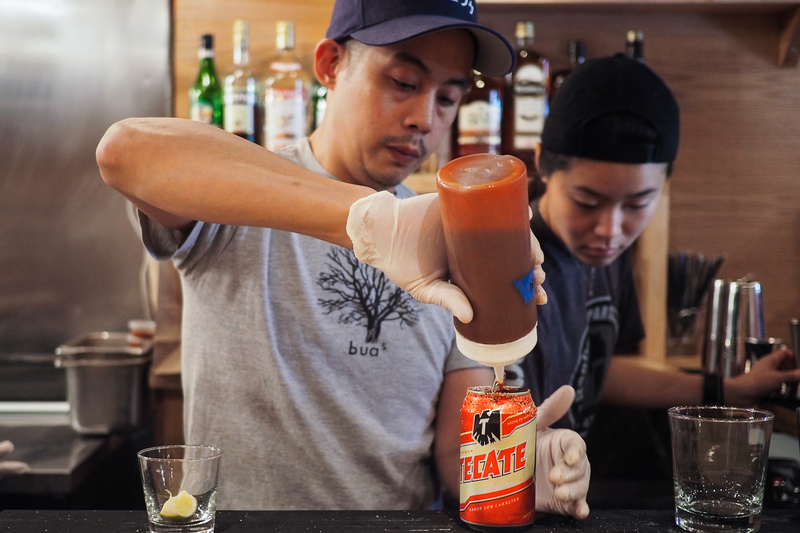 We ordered Fuku's version of a michelada just to try it out. 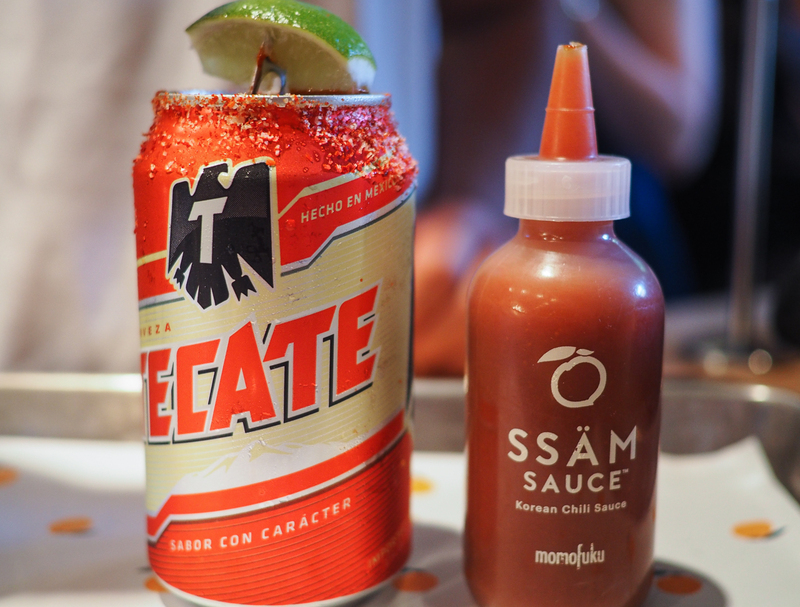 It's a Tecate + their signature Ssäm Sauce + some worcestershire sauce. Worked great with the sandwich. J had the 163 Ice Tea which was also awesome (and I would recommend it over my own michelada). It's made with gin, vodka AND rum, plus Dr. Pepper and tea. BOOM. Your fast food game will be changed forever. Standing room only - this is not a place to hang out for a long time unless you're planning to hang out in line. If you hate lines like I do, go grab a bite right around 3:45pm. When I went, there was barely a line (5 mins wait max), and they were serving sandwiches right up until 4pm when they close for lunch. My perfect order: The Koreano Sandwich (secret menu item with the pickled daikon slaw) + 163 Ice Tea. No fries (unless you're dying for fries and you're hungry AF), no salad (who are we kidding here). You'll definitely be full unless you're a monster. And if that's the case, just go up a few blocks to Momofuku Milk Bar and pick yourself up some dessert. Spicy food loving friends - there's nothing spicy here for you. Even the Ssäm sauce was mild in flavor. 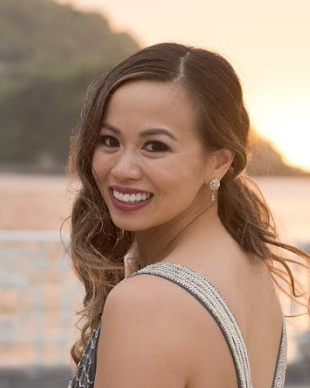 Hopefully Chang recognizes that and adds something for us!